Industrial Applications of Batteries looks at both the applications and the batteries and covers the relevant scientific and technological features. Presenting large batteries for stationary applications, e.g. energy storage, and also batteries for hybrid vehicles or different tools. The important aerospace field is covered both in connection with satellites and space missions. Examples of applications include, telecommunications, uninterruptible power supplies, systems for safety/alarms, car accessories, toll collection, asset tracking systems, medical equipment, and oil drilling. The first chapter on applications deals with electric and hybrid vehicles. Four chapters are devoted to stationary applications, i.e. energy storage (from the electric grid or solar/wind energy), load levelling, telecommunications, uninterruptible power supplies, back-up for safety/alarms. Battery management by intelligent systems and prediction of battery life are dealt with in a dedicated chapter. The topic of used battery collection and recycling, with the description of specific treatments for the different systems, is also extensively treated in view of its environmental relevance. Finally, the world market of these batteries is presented, with detailed figures for the various applications. Chapter 1. Nonaqueous Batteries Used in Industrial Applications (G. Pistoia). Chapter 2. 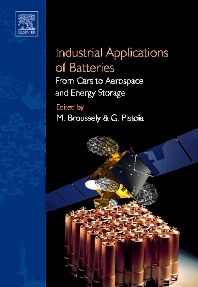 Aqueous Batteries Used in Industrial Applications (G. Pistoia). Chapter 3. Characterization of Batteries by Electrochemical and Non-Electrochemical Techniques (D. Aurbach). Chapter 4. Traction Batteries. EV and HEV (M. Broussely). Chapter 5. Aerospace Applications. I. Satellites, Launchers, Aircraft (Y. Borthomieu, N. Thomas). Chapter 6. Aerospace Applications. II. Planetary Exploration Missions (Orbiters, Landers, Rovers and Probes)(B.V. Ratnakumar, M.C. Smart). Chapter 7. Stationary Applications. I. Lead-Acid Batteries for Telecommunications and UPS (R. Wagner). Chapter 8. Stationary Applications. II. Load Levelling (J. Kondoh). Chapter 9. Stationary Applications. III. Lead-Acid Batteries for Solar and Wind Energy Storage (R. Wagner). Chapter 10. Stationary Applications. IV. The Role of Nickel-Cadmium Batteries (A. Green). Chapter 11. Miscellaneous Applications. I. Metering, Power Tools, Alarm/Security, Medical Equipments, etc (M. Grimm). Chapter 12. Miscellaneous Applications. II. Tracking Systems, Toll Collection, Oil Drilling, Car Accessories, Oceanography (H. Yamin et al.). Chapter 13. Battery Management and Life Prediction (B.Y. Liaw, D.D. Friel). Chapter 14. Battery Collection and Recycling (D. Cheret). 14.6.Recycling Rate: What Does It Mean? Chapter 15. World Market for Industrial Batteries (D. Saxman).